Round-trip bus transportation on a deluxe bus with restroom and WiFi. Admission to Algonquin Park included. Complimentary bottled water and small snacks on the bus included. Fully escorted trip with ShortTrips.ca tour director available during trip. Both hikes are optional. 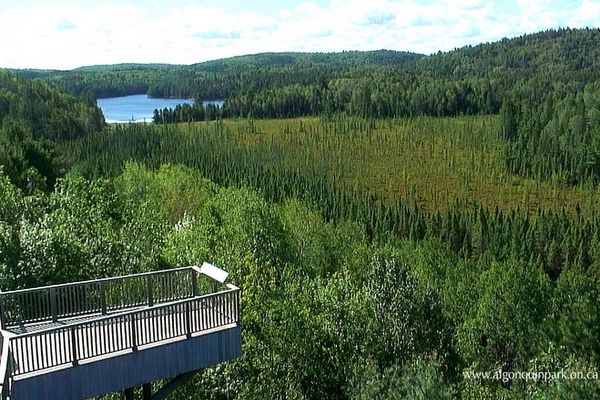 If you decided to skip the second hike, you will be taken back to the visitor's centre where you can enjoy the beautiful deck, the museum, a short film about Algonquin Park, the bookstore & giftshop, bathrooms and wifi. ​We will be stopping at highway rest areas on our way to the park and again on our way back from the park. Bathrooms and various fast food outlets are available at both rest areas. Children 10+ are welcome on this, same price as adults. During spring take in the beauty and subtle hues of Algonquin's spring colours. Enjoy the pastel green of Trembling Aspen leaves, the pink wash of distant Red Maples, the white of cherry blossoms, and the silvery puffs of the Largetooth Aspen. It is about 7,600 square kilometres in size and is 1.5 times the size of Prince Edward Island or about a quarter of the size of the country of Belgium. 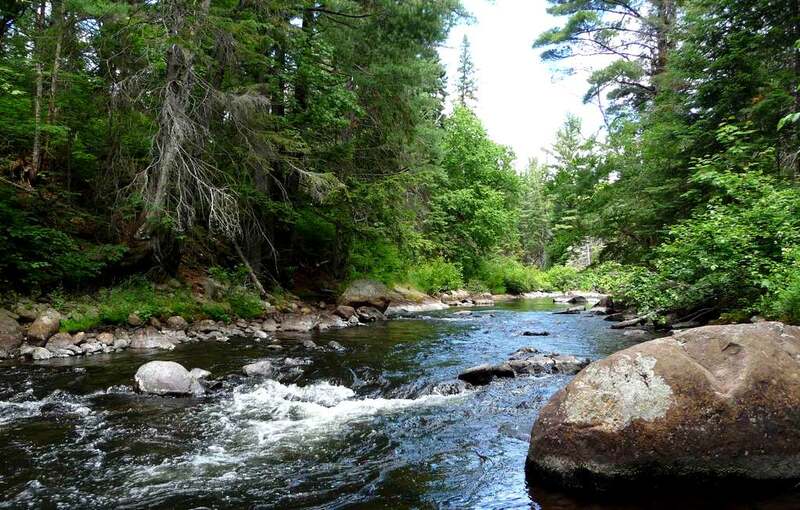 Over 2,400 lakes and 1,200 kilometres of streams and rivers are located within the park. The park is considered part of the "border" between Northern Ontario and Southern Ontario. It was named a National Historic Site of Canada in 1992. 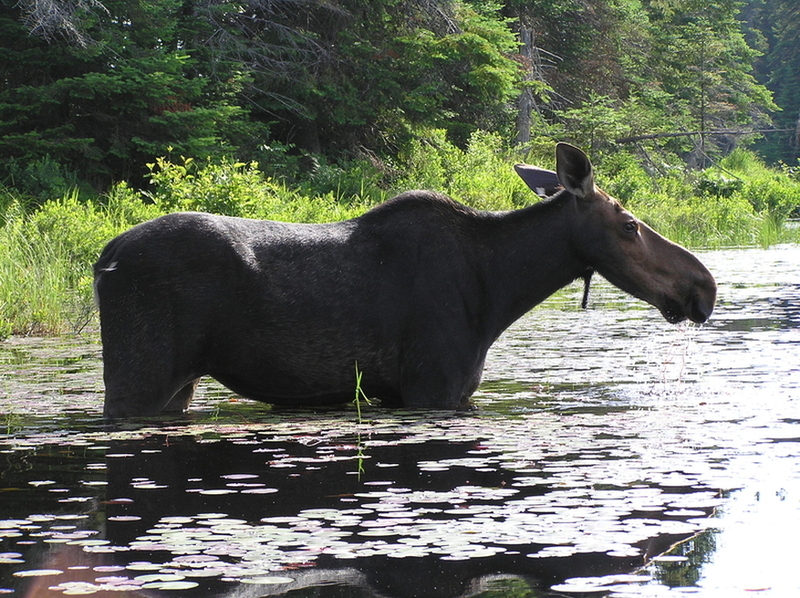 Spring offers the year's best Moose viewing. 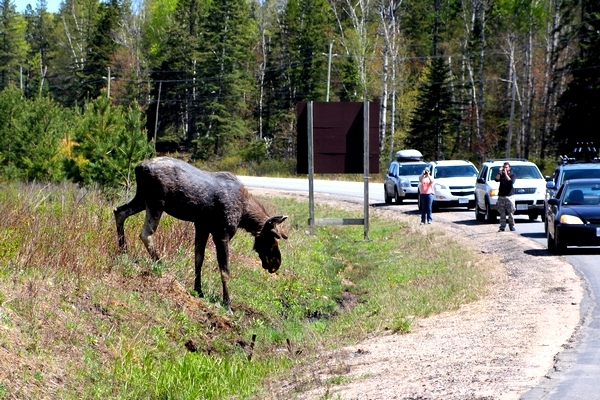 The application of road salt to Highway 60 during winter road maintenance operations, attracts Moose to roadside ditches. Moose with salt deficient winter diets, capitalize upon this unnatural source of salt and chances are you'll see a few or even more of these magnificent animals during our leisurely drive along Highway 60. ​Algonquin Park was the first provincial park in Ontario and is one of the largest parks in Canada with an area of over 7.600 sq.km. It's bigger than the province of Prince Edward Island! Opened in 1993 to celebrate the 100th anniversary of Algonquin Provincial Park and the entire Ontario provincial park system, the Algonquin Park Visitor Centre has exhibits on the Park's natural and human history, a cafe, an excellent bookstore & gift shop, a movie theatre that shows a film about the story of the park on a continuous loop, washrooms and of course the impressive viewing deck.